Capricorn people should be ready for a happening 2013. Its time to make some drastic changes in your life. You will focus sharply on your goals. You will also be greatly engrossed in office politics. You may start believing in your gut feelings. You may take a keen interest in various forms of arts particularly music and poetry. There is also likely to be a change in office or residence. You will do something new in life, to get rid of the boring routine. Physical changes in your domestic environment are likely. Due to this, your domestic life may be subject to some stress but you should not let your family members feel that you are taking decisions without their consent. Those living in a joint family may be subjected to great amounts of stress and to cope up with that a break in routine is needed and you may go in for a family tour. Elderly people in the family may require more attention now and you will have to back them up emotionally. Your partner's moral support is likely to increase in the second half of the year and that is when you will need it the most. Those willing to go in for a new relationship may go for it in the second part of the year. If the relationship is strong, it will sustain itself. Those already in a relationship may proceed towards married life and will tie the knot this year. Married couples need to support each other in order to keep things in balance. Between April and August, you and your partner may plan a long distant trip. Except for minor ailments during the change of seasons, no major health issue is foreseen for Capricorn people during the year. Your appetite may reduce a bit but this is good for your health. This is the right year to join the gym and then be regular in exercise. This year, if you don't do physical exercise, you may feel you are not taking proper care of your body and thus you may feel your efficiency is reduced. Shoulder and stomach will remain sensitive areas this year and you may even suffer from headaches. 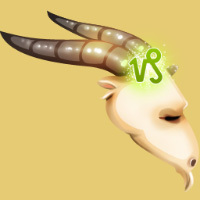 This is the right year to look for better job options for Capricorn people. Those of you who are willing to relocate have stars in their favor. It is also the right time to hone your skills and join some professional course. Those of you in business should invest in manpower and technology for progress. You should expect business coming in from a foreign land. Financially, this is an average year for Capricorn people. You can invest in property for higher profits. You should realize that unless you help others selflessly, they would never be ready to help you. On the home front, involve every member of the family in the decision making process.